Hotel Travelodge by Wyndham Juneau, Juneau, United States of America - Lowest Rate Guaranteed! With a stay at Travelodge by Wyndham Juneau in Juneau, you'll be near the airport, within a 10-minute drive of Mendenhall Glacier and Mendenhall Golf Course. 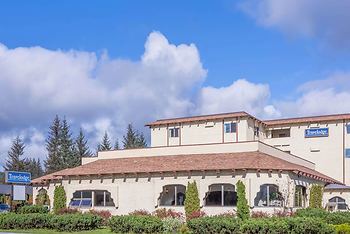 This hotel is 3 mi (4.9 km) from University of Alaska-Southeast and 3.6 mi (5.9 km) from Auke Bay. Good parking. The rooms arę Clean. Food is good the bar is a great way to relax. I have stayed there since the late 80s. And brought my softball team there. In 90s. Keep,up the good work. The room was a nice size. Though the furnishing were outdated, it was clean and comfortable. The location was great. It was within walking distance of the airport. The staff was friendly and courteous. Convenience of location to the shopping areas. It was very clean and the people were really nice. It was close to the Nugget Mall and a bit of a drive to town, but was worth it. Generally it was a nice stay. Pleasant people, good location, food and service nice overall. Logos, brands, and other trademarks featured within this site are the property of their respective trademark holders. These trademark holders are not directly affiliated with Hotelsone. Travelodge is a registered trademark.© 2001 - 2019 HotelsOne. All rights reserved.